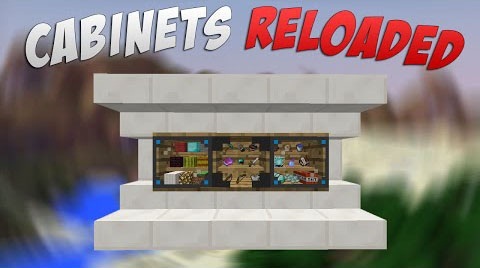 Cabinets Reloaded Mod enables players to show off and secure your precious items by adding to your Minecraft world 9 slots for storage. What is more fantastic is that you can set them to public or private as you like. They are blast resistant. You can now customize your cabinets individually to appear, function and troll the way you like. 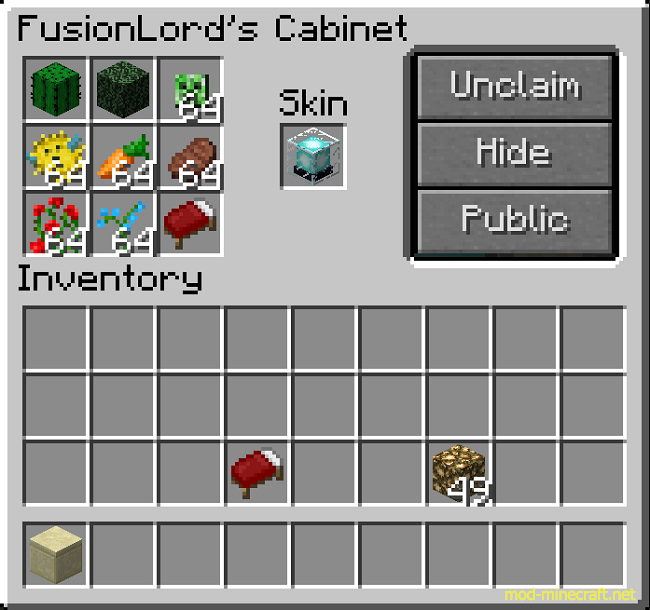 Cabinets now have two slots to place items into that will provide special abilities. Some items will only fit into the second slot as they provide a secondary ability beyond the primary and do not require a GUI. An example of a primary ability is crafting. So you would place a crafting table into the first ability slot which is below the buttons and the button just above that slot will update to say ?Craft!? So click the button and the crafting GUI will open for you. “Why do this?” you may ask. Well, concealment, space-saving, appearance. The beauty is you can un-slot the ?ability item? at anytime and replace it again or with a different ability item. There are some neat abilities available in the current version. An Example of a secondary ability is a torch. Placing a torch in the second ability slot will cause the cabinet to give off light as if the torch itself was placed in the block space of the cabinet. There are more cool secondary abilities as well. Try items to find them. 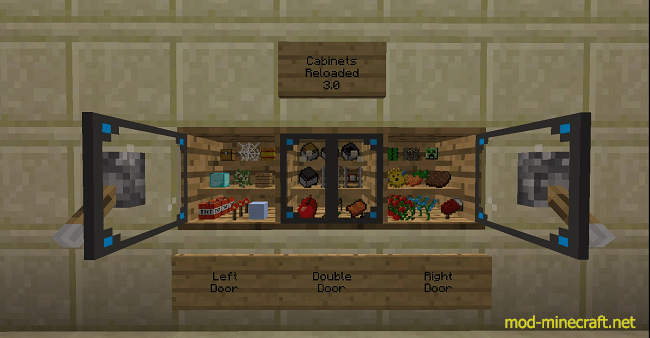 Place cabinets into a crafting table to cycle through cabinet door types. Skinning the cabinets inside and out to your liking is extremely versatile. You can use the glass door to show off items or you can skin the door with a chest armor to designate the cabinet as armor storage or pretty much anything to your liking within the minecraft and modded texture list. Unclaim: Click this button to drop ownership of the cabinet. The next player to open the cabinet will become the owner. Items: Shown: Click this to hide the contents of the cabinet. Items: Hidden: Click this to show the contents again. Access: Private: Click this to set the cabinet to public access. Access: Public: Click this to set the cabinet to private access. Yaw: <direction>: When placed, the cabinet door will face the player. Click this to rotate the cabinet. I.E. North, East, South and West. Note: when rotating the cabinet you will not be able to exit the GUI if the door is blocked, preventing re-opening, so just rotate to a safe position. Pitch: Flat: Click this to set the cabinet to up, down or back to flat again. Skinning: Private: Click this to allow other players to change the cabinet skin. Skinning: Public: Click this to make skinning the cabinet by the owner only. Door Type: Left: Click this to cycle through the door types: Left, Right and Double. Back: Click this to close the Settings GUI and re-enter the Cabinet GUI.